How Do They Sound Compared to J Bass Pickups? The Precision Bass – lovingly known as the P Bass – was Leo Fender’s first electric bass design, introduced in 1951. Although it certainly wasn’t the first electric bass, the P Bass undoubtedly changed the way musicians thought about the instrument, and has become one of the most popular bass models of all time (alongside Fender’s later Jazz Bass). Legendary P Bass players include Sting, Roger Waters, James Jamerson, and Tony Franklin, while the instrument is also well represented in modern rock – Robert Trujillo, Matt Freeman (Rancid), Mike Dirnt (Green Day), Nate Mendel (Foo Fighters), and Iron Maiden’s Steve Harris are all enthusiastic P Bass devotees. Unlike the pickups on a Jazz Bass, P Basses only feature one split single-coil pickup. But considering this minimalist design, the P Bass is actually one of the most versatile instruments ever created! There’s more on the pickup configuration in our guide below. Whatever your reason for buying a new Precision Bass pickup, our chart highlighting some of the best P Bass pickups on the market today will give you a little inspiration, before our guide below will help you understand what makes a great P Bass pickup. It’s worth noting that in our chart we only highlight pickups intended for four-string bass guitars, as opposed to five-string basses. The best P Bass pickup around? A powerful P Bass pickup with an edge. Excellent value for a superb P Bass pickup. A solid pickup set, with great balance. True Black Sabbath tone from this signature set. Looking for the bass sound that started it all? This Fender-made pickup has more than enough quality to claim the spot as best pickup in this chart – after all, it’s from the company that invented the P Bass! This higher-end bridge pickup is made with flush-mounted Alnico V magnets and enamel-coated magnet wire, and faithfully replicates the tone of the original 1962 Fender P Bass pickups. Who could say no to that? The tone remains well balanced, with a beefy low-end that’s strong but tight, a punchy mid-range, and bright, clear highs. It demonstrates great versatility and is capable of impressing in all genres, with excellent articulation and detail. Undoubtedly the easiest way to turn an affordable Squier into an American-made P Bass (in tone at least)! DiMarzio’s DP122 offers any Precision bassist huge power and attitude at a very affordable price. It’s perhaps the most modern pickup on our list when it comes to tone, while they look pretty cool too, with their ominous blacked-out design. Made with a powerful ceramic magnet, this hum-cancelling bridge pickup delivers a huge output that’s most comfortable with the heavier styles of music – for hard rock and metal in particular, these are awesome and have a real edge. For the bassist who loves a high-gain, big bass sound, these impress as the focus seems to fall more on the low-end than the trebles, with warm, full fat tones that retain their clarity as the volume gets higher. Awesome! This is a brilliant P Bass pickup from Seymour Duncan, and is even harder to fault when you consider the price. The sound on offer is perfect for players wanting an upgrade from a stock pickup, delivering power and punch in high doses. Handmade in California, this Quarter Pound makes use of a large diameter Alnico 5 magnet and a high-output coil wind for big volume, plenty of low-end thud, and a big mid-range presence. It’s surprisingly versatile, although heartily recommended for heavy rock and metal, with booming bass tones that don’t get muddy when the volume and gain increase, while it’s also vacuum wax potted to make feedback a thing of the past. Installation is also relatively simple. Bartolini are well-known for making a quality pickup, and their P Bass pickup – the 8S – is a worthy inclusion in our chart. This stylish passive single-coil is made with a ceramic bar magnet for a powerful output – super hot with a big growl. There’s a definite focus on the low-end and mid-range – less so in the higher registers, which results in less shrill trebly sound as the volume increases. The tone is super smooth and balanced, with a warm organic sound. Thankfully, it comes potted in epoxy to reduce feedback, so this pickup is instantly stage-ready. As for price, it’s a little higher than we expected, but for the tone on offer it’s certainly worth the cash. Overall, the S8 can breathe life into any P Bass. While some on this list capture the vintage Fender tone from the early ‘60s, this EMG bridge set show off vintage in a different way. Namely, vintage Black Sabbath, as the band’s legendary bassist Geezer Butler worked with EMG to develop a passive pickup that captured his signature tone, as heard on everything from War Pigs to Paranoid. 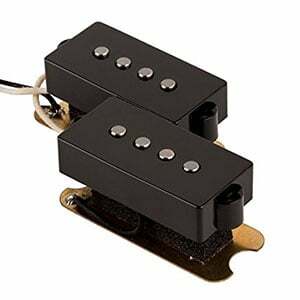 The pickup features Alnico 5 magnet pole-pieces and two custom-wound split-coils, to deliver a warm but punchy tone. The output is hot and the low-end defined and tight, making it suitable for all styles of rock. There’s certainly some modern enhancements to the tone, such as hum-cancelling capabilities, but this pickup is a surefire way to get that famous classic rock sound on any P Bass. The anatomy of a P Bass pickup is distinctive and pretty unique when compared to other modern pickups, as it’s essentially a single-coil that’s also a humbucker. You’ll find two small single-coils split to cater for two strings each. These two single-coils are wired in series, with one coil reverse-wound to cancel the dreaded 60-cycle hum. As for the positioning, a P Bass pickup is located in the bridge/middle position, which is higher than the bridge pickup on a J Bass, but lower than its neck pickup. Ultimately, a good P Bass pickup will give you a tight and meaty tone, with plenty of heft in the low-end, a strong mid-range, and bright clear highs – all of which retain their clarity as the volume and gain increase. A good pickup will also keep background noise very low, with little to no hum or excess noise. Considering there is just one of them, Precision Basses are very versatile in their tone and can be used in all styles of music to great effect. Compared to a Jazz Bass, a P Bass offers a fatter sound with a low/mid tone that’s tighter than the J Bass neck pickup and lower than the J Bass bridge pickup. Due to its humbucking nature, a P Bass pickup is also quieter when it comes to background noise, making them particularly good for high volume and high gain styles. Of course, each pickup manufacturer and model has its own unique tonal profile, and no two pickups sound identical (where would be the fun in that?!). It doesn’t matter how cheap your bass is, if you change stock pickups to something with a little more punch, heat and quality, you can technically make a $150 Squier P Bass sound like a high-end American-made Fender P Bass! While they are great for upgrading the tone and versatility of an affordable bass, adding a set of quality pickups to an already decent bass can add a new edge – maybe increasing the overall output for heavier styles, or adding some vintage tone to a modern bass. It’s worth remembering that pickups are sometimes complicated to fit, so it’s worth asking a local guitar professional to install them for you. This usually warrants a small fee, but it can be well worth it to avoid the potential hassle. Hopefully our chart has given you a little inspiration when shopping around for a great P Bass pickup, although don’t take our word for it – go out and try them yourself. Your tastes and aspirations are unique to you, so make sure you know exactly what you are buying before you part with your cash. Read some reviews, listen to audio samples, and – if possible – try out your favorite pickups first. Also bear in mind that while changing the pickup can result in a great tonal enhancement, other aspects such as the amplifier, cables and pedals you use – as well as your technique – will make as big an impact on the overall sound. All the best when hunting for your perfect P Bass pickup – and have fun playing! Stock Fender USA vintage style pickups sound awesome. No reason to use anything else. IMO, quarter pounders have a weird scooped sound.